Willem Dafoe plays Vincent Van Gogh in this expressive biopic, concentrated on the Dutch painter’s later years in Arles and Auvers-sur-Oise, France, shortly before his death at age 37. Director Julian Schnabel, a painter himself, rightly focuses on Van Gogh’s most prolific period, in which the artist churned out more than 200 paintings in 15 months, with minimal dialogue and striking visual poetry. Other influential characters - Van Gogh’s loving brother and benefactor, Theo (Rupert Friend) and his demonstrative peer, the French painter Paul Gauguin (Oscar Isaac) - drift into the film, reminding the painter to soak up the vivid, quotidian ephemera of his surroundings when he is, for the most part, living in solitude. 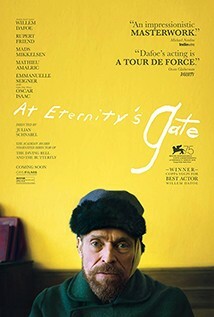 Dafoe fully commits to his performance, as does Schnabel to the painter’s vision and humanity. This is a journey inside the world and mind of a person who, despite skepticism, ridicule and illness, created some of the world's most beloved and stunning works of art.